Size: 84 cm in length from the beak to the tip of the tail. Back and wings turquoise. Sides of neck, breast and belly golden. Forehead and crown greenish-blue. Throat black, cheeks white bordered in black stripes. Bluish-yellow undertail coverts. Eyes yellow, beak and legs black. Female is smaller, immatures have dark eyes. Intelligent and sociable, the Blue and Gold Macaw usually does well as a pet when the owners are dedicated, responsible, and well informed. They are large birds, and as such are capable of extremely loud vocalizations. Because of this, they may not be the best choice for those who live in apartments and condominiums, or that have small children. Leaves, seeds, fruits, nuts, parrot food, mealworms, cheese, greenstuff. Their strong beaks can find weakness in the design and construction of their housing. Blue and Gold Macaws are active birds, and they love to climb, swing, bounce, and chew. Those who own Blue and Gold Macaws should provide a minimum of 2-3 hours of playtime outside of the cage each day so that they birds can stretch and exercise their muscles. Strong toys are a must, as the Blue and Gold's beak is known to be destructive. These birds have powerful jaw muscles, and chewing is neccessary to keep them healthy and in shape. 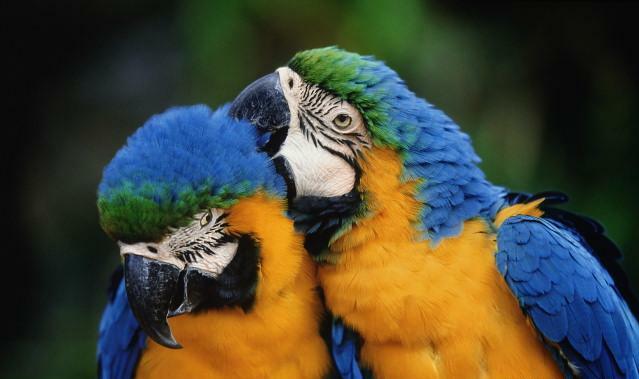 Blue and Gold Macaw are affectionate, loyal, gentle, intelligent. Can learn tricks and to imitate and talk. Can live 100 years or more. May become aggressive towards keepers during breeding season. Roomy cages of mesh with climbing branches, heated covered areas and - as playthings - fresh branches, pinecones and stones. Nest box, year round for roosting, 50 X 50 X 80 cm, entrance 14 cm. Lays 2 to 5 white eggs, incubation 25 to 28 days, fledging after 3 months.